The recent announcement touting the release of four new Bose headphones is huge news to the headphone geeks here at headphone.com. After all, not only is Bose the biggest name in the business by far, selling more headphones than most of the rest of the industry combined, but they have also really stepped up their audio research & development efforts over the past decade to deliver truly impressive sound quality. Most notably, their full size noise-canceling ‘QuietComfort’ flagship cans have reigned as the uncontested kings of the category with excellent musical detail and extended dynamics that were unimaginable back in the early days of noise-canceling headphones. There is an unassailable reason why Bose models are ubiquitous on any long airline flight: they’re just better at the task than other noise-canceling headphones. 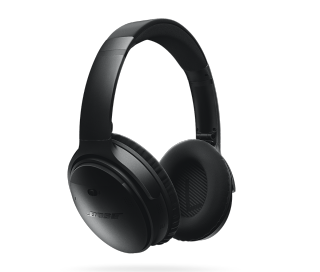 The most exciting reveal in the 2016 line of Bose headphones is the introduction of wireless Bluetooth connectivity for all new models including the top-of-the-line QuietComfort 35 noise-canceling headphone, the successor to the best noise-canceler we’ve heard to date, the Bose QuietComfort 25. Expectations run high for the new Bose flagship to step up the game over previous models in sound quality, noise-canceling ability and flexibility of use. Especially for Apple aficionados who - as internet rumors suggest - may likely lose the 3.5mm mini headphone jack in the upcoming series of iOS products, the Bose QC35 wireless connectivity will allow pairing with all the newest players and sources. Per Bose engineers, their QuietComfort 35 crown jewel boasts updated miniaturized microphone arrays placed both inside and outside the earcups that enable the QC35 to detect, evaluate and steer unwanted sounds to proprietary digital chips within each earpiece that respond with equal/opposite signals in a fraction of a millisecond to cancel intruding ambient noise. The QuietComfort 35 also features an automatic volume-optimized EQ curve designed to present the very best tone and musical clarity at any volume setting. And the extended 20 hrs of battery life should make that cross continental flight with total ease. The QuietComfort 35 is shipping now in either black or silver-grey colors, although availability may be slightly limited for a while due to very heavy initial demand. The other new notable Bose release [due in stores September 2016] is the in-ear QuietComfort 30 model which will be the company’s first wireless in-ear headphone with noise-cancellation technology and a neckband construction. The QC30’s six embedded sensor microphones allow listeners to fully control and dial in the exact level of noise cancellation to perfectly match the surrounding conditions, from a quiet library to a busy street cafe to a rumbling airplane flight, all at the touch of a button. So you’ll be able to turn down the NC feature if you wish to remain aware of your surroundings, a nice plus for safety when out and about in the hectic big city or while jogging around traffic in the neighborhood. All the 2016 Bose headphones include access to the newest ‘BoseConnect’ app for additional functionality. The app allows you to manage multiple Bluetooth devices by simply dragging your wireless Bose headphones onto the device you want to use and it will connect automatically. Other Bose app features allow you to quickly switch between devices, from music on one player to a phone call on another device. You can also change the voice prompt language, set an automatic timer for the Auto Power-Off feature and even personalize the headphones with your name. The BoseConnect app also downloads the latest software for your new Bose wireless headphones and installs it only when you’re ready, so you are never forced to update unless you want to. The app provides continually updated Bose headphone information, meaning the Bose help desk is always available right at your fingertips. Please note the BoseConnect app only works with the new QC35, SoundLink wireless II and the SoundSport wireless headphones and is not compatible with other Bose products. In the rapidly growing exercise category, Bose has announced two all-new in-ear wireless headphones which will be available in either black or aqua blue colors. There’s a lightweight wireless in-ear headphone called the SoundSport and a similar model called the SoundSport Pulse outfitted with a heart rate monitor within the earbud that is said to be as accurate as a dedicated chest-mounted monitor. Both SoundSport models are completely sweat and water resistant and feature proprietary Bose ‘StayHear+ Sport’ earbud tips designed to stay comfortably in place as well as survive all that heavy sweating. The built-in acoustic ports in the SoundSport headphones are positioned to resist moisture or extreme bad weather and the hydrophobic cloth on the cabling also helps keep the water away. The Bose SoundSport in-ear headphones have a 6 hour battery life and are priced at $149.95. The Bose SoundSport Pulse in-ears with the heart rate monitor are slated to be priced at $199.95 [available in stores September 2016] and this feature-rich exercise headphone provides a slightly shorter 5 hour battery life. You are correct! Another headphone, the Phiaton BT 100 NC, has a neckband style that also has noise cancelling technology. So “the industry’s first” is not an accurate statement, more “the companies (Bose) first” would be the case here. I wouldn’t quite say that. Bose has come a long way as far as sound quality in their noise cancelling headphones, hiowever they still have that Bose sound signature that we would not say is quite “audiophile” quality. Most higher quality Bluetooth headphones no longer have the Bluetooth hiss, or have brought it down to practically inaudible levels. “The other new notable Bose release [due in stores September 2016] is the in-ear QuietComfort 30 model which will be the industry’s first wireless in-ear headphone with noise-cancellation technology and a neckband construction.” <- Not true, Audio Technica has already released the ATH-ANC40BT for a while now. Has Bose finally given in to accurate sound reproduction over their Bose-sound? Has Bose been able to eliminate the Bluetooth hiss?